I'm only slightly disturbed by this awesome picture. Well happy b-day to Shine and many more years to come! 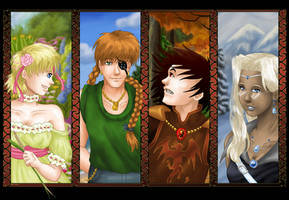 An awesome picture for an awesome webcomic that's been going strong for six awesome years! Booyah! Six years and still going strong! Has it really been six years already? cool. but whats with the teletubby like thing in the middle? The little purple guy? That would be Chuchu, Anthy Himemiya's familiar from Revolutionary Girl Utena. This brings back memories of her slamming the castle doors in the Movie. Shine is epic, my girl. If I remember right, that's a little mouse type thing from Revolutionary Girl Utena that made a guest appearance on Timothy's first mission for the Iscariot branch. Isn't Iscariot from Hellsing, not RGU? Yes, Iscariot is from Hellsing, Timothy joins their ranks. Oh ok. lol just checking my facts. This is And Shine Heaven Now. It's one of the biggest crossovers since Infinite Crisis. Yes I know, I was just commenting.